Arsenal star Ainsley Maitland-Niles has brilliantly decided to respond to individual fans on Instagram as they criticise him after the win over Huddersfield Town. 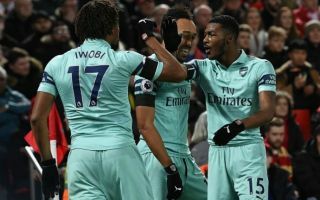 The Gunners were not at their best as they ground out a win against one of the Premier League’s relegation strugglers, but goals from Alex Iwobi and Alexandre Lacazette just about saw them through. Maitland-Niles even picked up an assist on Arsenal’s second goal, but it seems the youngster isn’t every fan’s cup of team. The 21-year-old has seen more first-team action for the club this season, playing in a variety of roles, but mostly as a full-back. And to be fair to the guy, he seems to be taking the criticism on the chin, giving a classy response to pretty much every fan commenting on his Instagram. Most fans will surely be being more patient than this lot, but will also hope he can take something from this and improve his on-pitch displays between now and the end of the season.